Researchers: M. R. Siegfried, University of California, San Diego and Stanford University; B. Medley, NASA-Goddard; K.M. Larson, University of Colorado, Boulder; H. A. Fricker, University of California, San Diego; and S. Tulaczyk, University of California, Santa Cruz. 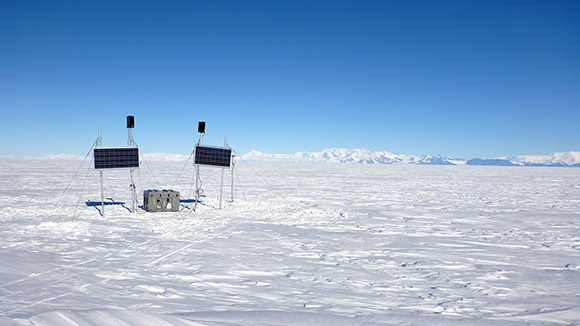 Measuring snow accumulation over Antarctica is critical to understanding ice-mass changes related to climate change, sea-level rise, ice dynamics, and even crustal processes. Snow accumulation along the Mercer and Whillans ice streams in West Antarctica was measured between 2007 and 2017 with an array of Global Positioning System (GPS) stations. The snow was measured using the signals from GPS satellites that reflect off of the snow surface into the bottom of the station antenna; an innovative and cost-effective method called GPS interferometric reflectometry (GPS-IR). 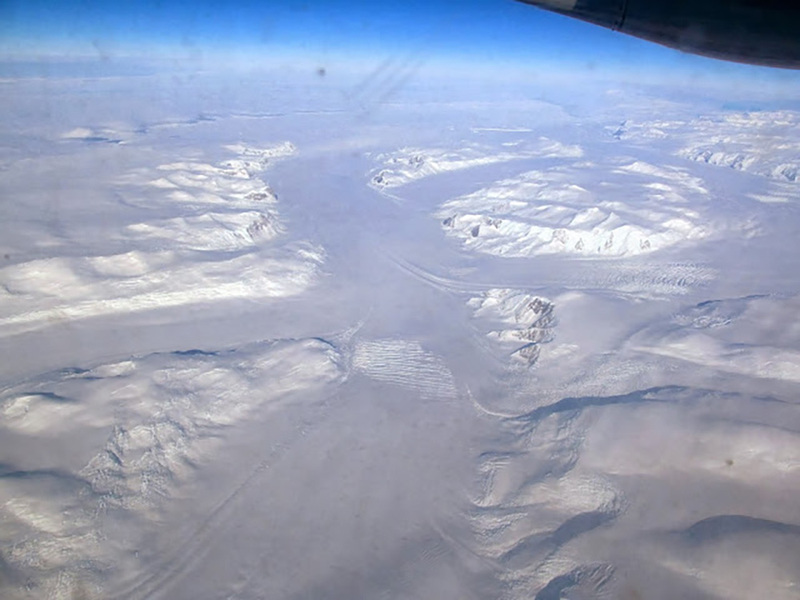 The method was validated with field measurements and the results are comparable to other types of snow observations like shallow ice cores as well as models of atmospheric processes. This study demonstrates for the first time in Antarctica that GPS-IR is an effective method to measure ice sheet surface change at daily resolution with centimeter-level precision. The large continent of Antarctica is covered with ice and knowing how much the volume and mass of ice in Antarctica changes is essential for understanding ice-flow dynamics, glacial isostatic adjustment, and the extent to which this ice sheet contributes to global sea-level change. The amount of ice in Antarctica is controlled by snow falling and accumulating on the surface, sublimation, freezing, thawing, and melting. It is difficult to measure net snow accumulation on the continent partly because of its remote emptiness and partly because of environmental dynamics. There are only a few points where snow accumulation is measured directly and these observations typically only occur for short time periods. These single points can be highly influenced by other surface processes that vary on short length-scales, like sublimation and winds. Here, the authors use GPS-IR to measure snow accumulation. An array of GPS stations have been making continuous direct measurements from 2007 to 2017 along the lower confluence of the Mercer and Whillans ice streams in Antarctica near the southern edge of the Ross Ice Shelf. By comparing the direct GPS satellite signal with the ice surface reflected signal, the height of the antenna above the ground can be calculated. For a typical 2-meter high antenna, the snow accumulation can be measured over an area of 3600 square meters. This measurement can be repeated every day, providing a continuous observation of the average amount of snow accumulated in the region around the antenna. The GPS-IR measurements yield mean rates of 0.164 to 0.215 meters per year of snow accumulation over decades, which is consistent with the mean rate of about 0.22 meters per year derived from a nearby ice core that was used to estimate the average accumulation rate over 42 years. 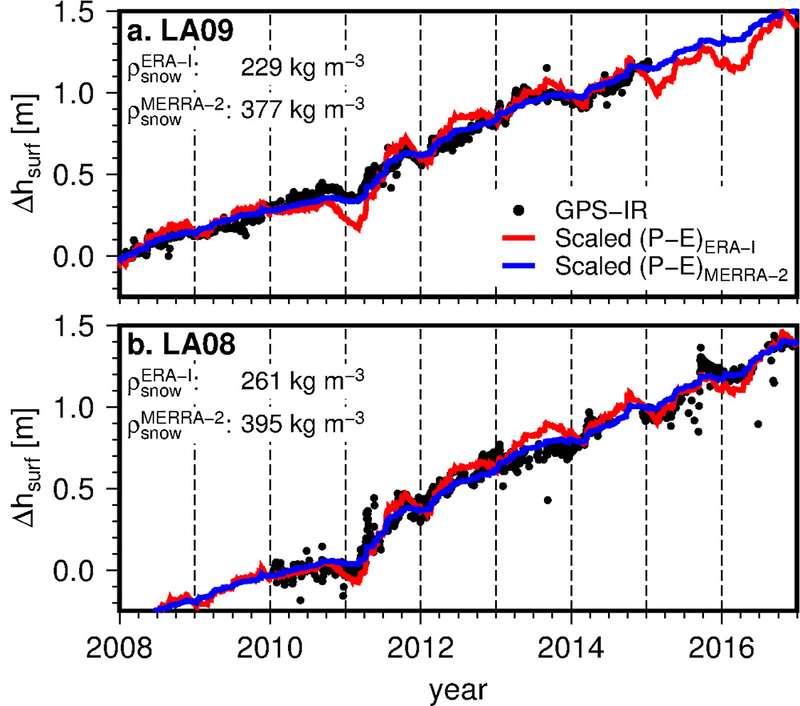 The GPS-IR measurements show significant spatial and interannual variability in snow accumulation rates; further study of this variability should lead to new insight about the regional atmospheric and ice dynamics and environment in West Antarctica. Not only should future measurements of snow with GPS-IR continue, in addition, older GPS records in Greenland and Antarctica from the past 25 years should be revisited to understand snow accumulation rates and their impact on ice sheet dynamics and global change.